Creatine is an amino acid derivative that plays an important role in energy storage. Its phosphorylated form, phosphocreatine, is responsible for phosphorylating adenosine diphosphate (ADP) into adenosine triphosphate (ATP).1This is an important reaction because ATP acts as a phosphate donor which is responsible for catalyzing various reactions in the brain and muscle tissues that are essential for maintaining high function. While 95% of the body's creatine is found in skeletal muscle tissues, creatine also has effects in brain tissue. A number of studies have examined the effects of creatine on cognitive performance, mostly with respect to attention and working memory. Creatine (Cr) is converted into phosphocreatine (PCr), its active form. Subsequently, phosphocreatine is responsible for acting as a phosphate donor, in order to convert ADP to ATP. An increase in ATP levels is very important, as ATP acts as a phosphate donor that catalyzes many processes in the brain and muscle tissue. Creatine has been shown to speed up reaction times in the Choice Reaction Time task, at 24 hours after ingestion. Creatine was found to improved performance on the word recall task, a test for memory. Creatine supplementation may be beneficial for metabolic and cognitive gains. We recommend creatine supplementation for serious athletes who desire to achieve peak physical performance, as there is substantial evidence showing benefits of creatine on athletic performance. In the context of cognition, there is promising evidence regarding the efficacy of creatine for cognitive peformance, particularly with regards to attention and fatigue. Vegetarians may be interested in creatine supplementation, as some vegetarian diets may be mildly deficient in creatine. For other people, the potential gains from creatine may not outweigh the costs associated with careful dietary planning self-monitoring that is required in order to maintain safety. It is important to maintain adequate hydration when leveraging creatine for these purposes, as well as to plan out supplementation cycles. Owen, L., & Sunram-Lea, S. I. (2011). Metabolic agents that enhance ATP can improve cognitive functioning: a review of the evidence for glucose, oxygen, pyruvate, creatine, and L-carnitine. Nutrients, 3(8), 735-755. Guoyao, W. U., & Morris, S. M. (1998). Arginine metabolism: nitric oxide and beyond. Biochemical Journal, 336(1), 1-17. Lyoo, I. K., Kong, S. W., Sung, S. M., Hirashima, F., Parow, A., Hennen, J., ... & Renshaw, P. F. (2003). Multinuclear magnetic resonance spectroscopy of high-energy phosphate metabolites in human brain following oral supplementation of creatine-monohydrate. Psychiatry Research: Neuroimaging, 123(2), 87-100. Pan, J. W., & Takahashi, K. (2007). 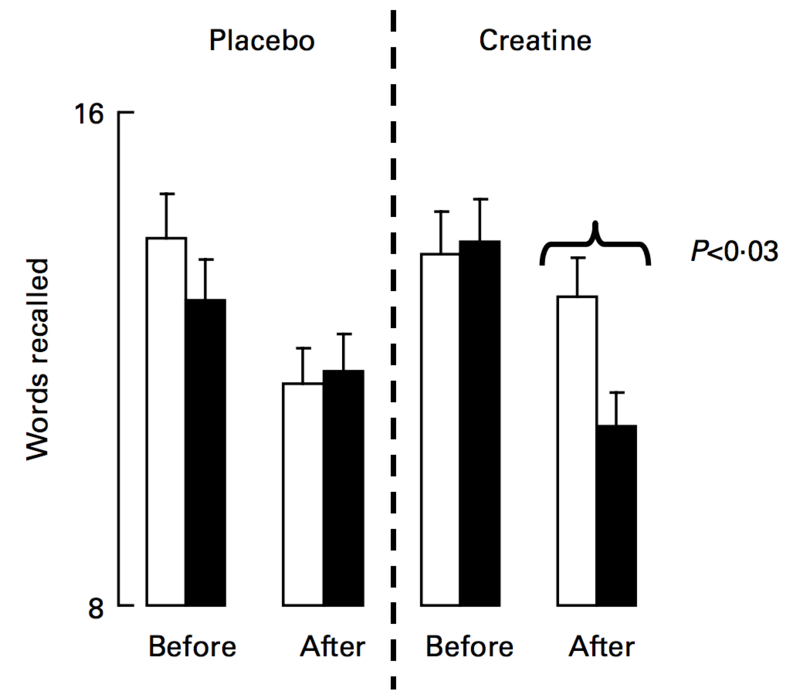 Cerebral energetic effects of creatine supplementation in humans. American Journal of Physiology-Regulatory, Integrative and Comparative Physiology, 292(4), R1745-R1750. McMorris, T., Mielcarz, G., Harris, R. C., Swain, J. P., & Howard, A. (2007). Creatine supplementation and cognitive performance in elderly individuals. Aging, Neuropsychology, and Cognition, 14(5), 517-528. McMorris, T., Harris, R. C., Swain, J., Corbett, J., Collard, K., Dyson, R. J., ... & Draper, N. (2006). Effect of creatine supplementation and sleep deprivation, with mild exercise, on cognitive and psychomotor performance, mood state, and plasma concentrations of catecholamines and cortisol. Psychopharmacology, 185(1), 93-103. Rawson, E. S., Lieberman, H. R., Walsh, T. M., Zuber, S. M., Harhart, J. M., & Matthews, T. C. (2008). Creatine supplementation does not improve cognitive function in young adults. Physiology & behavior, 95(1), 130-134.